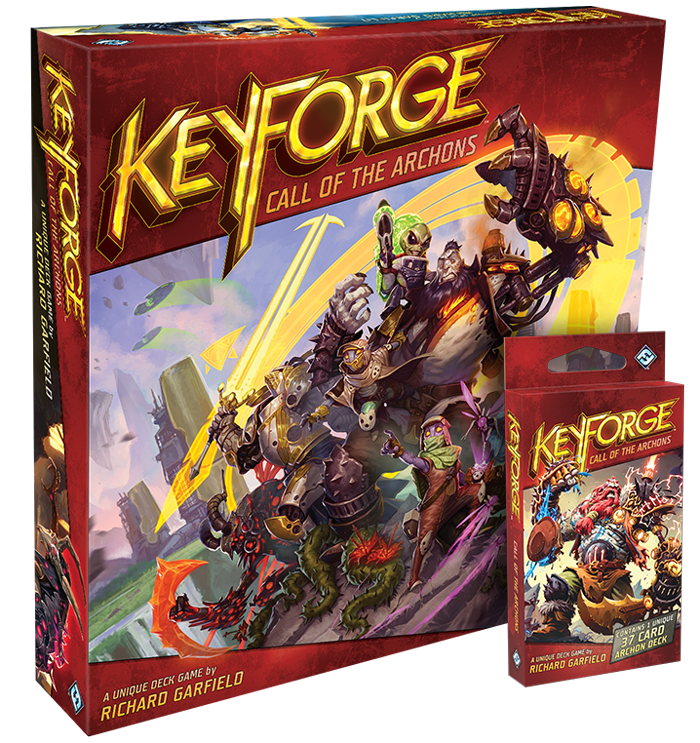 Order your own copy of KeyForge: Call of the Archons at your local retailer or online through our website today! It doesn’t matter what the treasure is, only how it was won. From the mind of Richard Garfield comes KeyForge, the world’s first Unique Deck Game! On the planet of the Crucible, you will step into the role of a mighty Archon, who must lead a diverse team assembled from the creatures, technologies, artifacts, and abilities of the Crucible’s Houses as you race to gather precious Æmber that will unlock the planet’s hidden Vaults. Only one can claim the full knowledge and power of this planet. Do you have what it takes? What sets KeyForge apart? 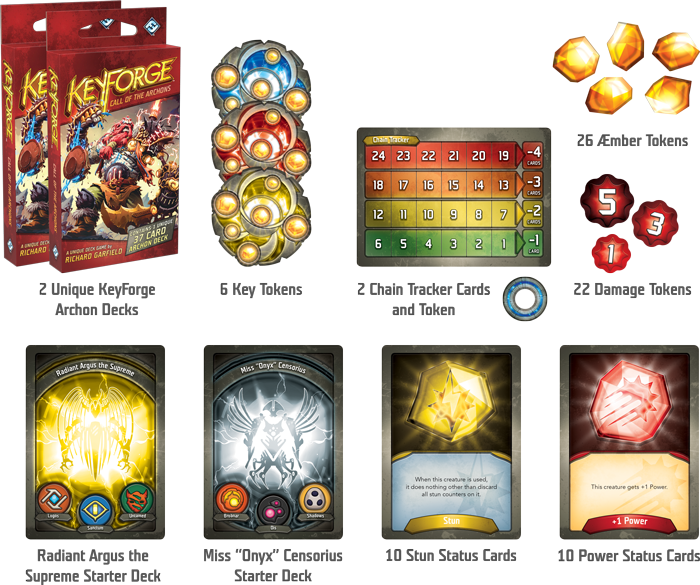 KeyForge is the first Unique Deck Game, meaning that every Archon Deck is one-of-a kind—unlike any other deck in existence. With every deck presenting its own Archon and distinct combination of cards, every game is a new adventure of discovery and exploration. Every deck is made up of 36 cards, but it's not the cards that make your deck special, but the interactions between those cards—strategies and tactics which can only be found in your deck. 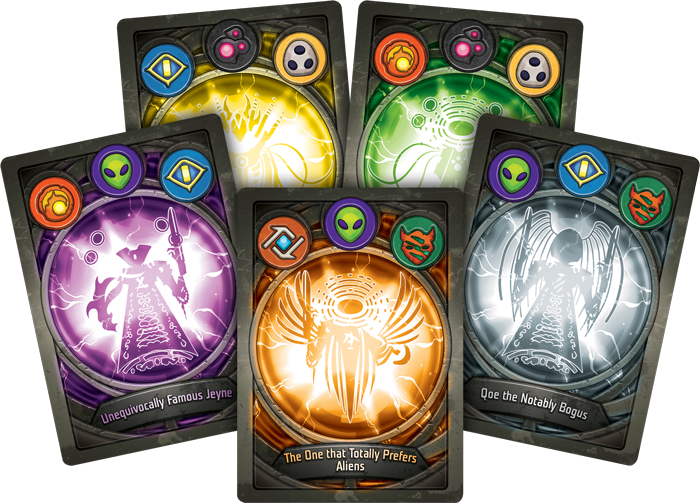 You must discover the most powerful synergies within your Archon Deck in order to master it and challenge yourself to make tough tactical decisions in every game. With over 104 quadrillion possible decks, every player has the chance to become the best in the world at playing their decks and discovering the strength within. 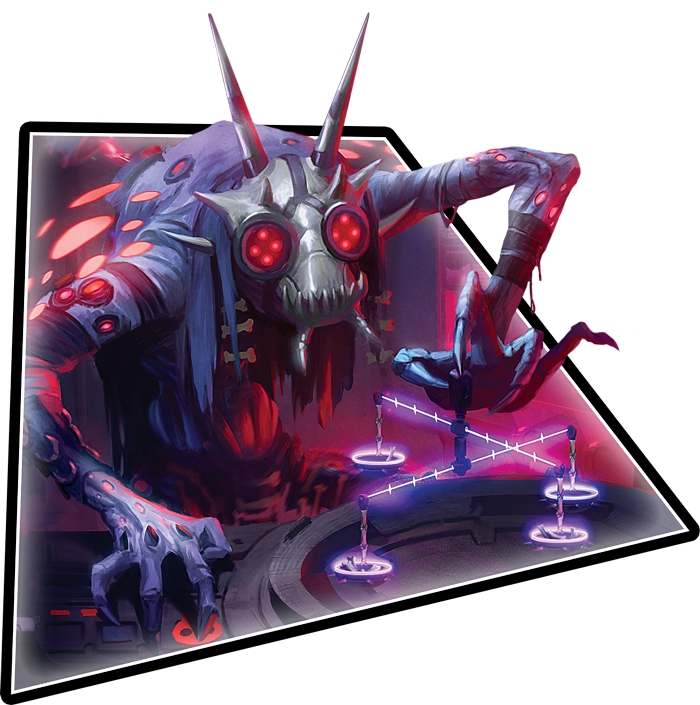 Within each of unique Archon Deck of KeyForge: Call of the Archons, you will find creatures from three of the Crucible’s seven Houses: Brobnar, Dis, Logos, Mars, Sanctum, Shadows, and Untamed. Each of these factions has its own culture, history, and skills that help them stand against their rivals and interact with their allies when the Archons sound the warhorns. Over a series of fast-paced turns where the advantage can turn in an instant, you will use your followers to reap Æmber, hold off your enemy, and forge the three keys needed to unlock the Crucible’s hidden Vaults and win the game. You begin your turn by declaring one of the three Houses within your deck, and for the remainder of the turn, you may only play and use cards from that House. Choosing your House is just the start of the tough tactical decisions, as you must leverage the cards in your hand and in play to gain the upper hand. 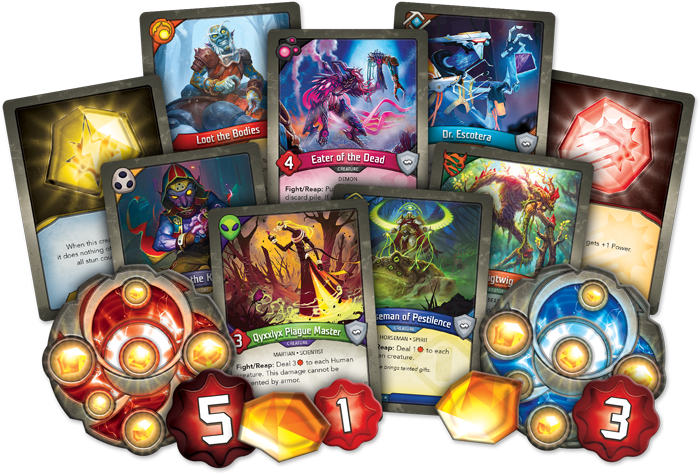 Choosing to reap more Æmber now or take the fight to your opponent… picking the exact sequence of events to pull off a massive combo… these are just a fraction of the choices that can emerge in a game of KeyForge! But always remember that balance is key. If you allow your rival to grow their army, they will soon outnumber and destroy your forces. But if you focus on the thrill of the fight and neglect reaping, you won't move any closer to unlocking the Vault. If you can find the balance and possess six Æmber in your pool at the start of your turn, you will forge a key and move one step closer to victory. The first player to forge three keys will gain access the Vault and earn victory. When you jump through the wormhole to begin your clashes on the Crucible, the KeyForge: Call of the Archons Starter Set is the perfect place to begin. In this set, you will find two standard training decks: Miss “Onyx” Censorius and Radiant Argus the Supreme. These decks have the same cards in every copy of the Starter Set, and they're perfect for taking your first steps into the Crucible. Then, once you have mastered the starter decks, you can continue your games with the two unique Archon Decks that are also included in the Starter Set. Finally, you'll find all of the keys, tokens, chain trackers, and status cards that you and your opponent need to start playing. If you wish to continue your exploration of the Crucible, you can expand your arsenal of teams with Call of the Archons Archon Decks. Every Archon Deck contains a full play experience with a deck that cannot be altered, so you're always ready to play, right out of the box. 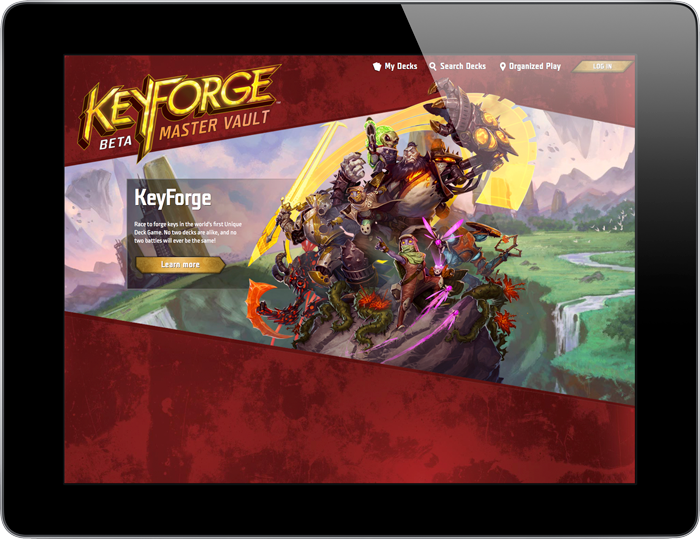 Then, you can track your teams using the KeyForge Master Vault. Here, you can register your Archon Decks, follow the performance of your own decks and those belonging to other players, and easily find the latest information about KeyForge Organized Play. The world of the Crucible is vast, but by learning from your teams and your rivals, you may just discover more than you ever thought possible. The time has come to don the mantle of the Archon and lead your team to victory. Accept the challenge of the Architects, unlock the secrets of the Crucible, and enter a world where anything is possible!